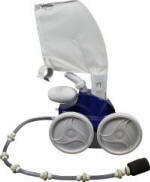 Polaris 360 Pool Cleaner | Aquaquality Pools & Spas, inc.
Any Other In-Ground Pool Cleaner? Want the same Polaris® cleaning style without the added purchase and energy cost of a booster pump? Then the Polaris® 360 is for you. It mimics its Big Brother, the Polaris® 380 and offers the same three wheel icon-design and pressure wash performance. Double-Jets aerate the pool and sweep even embedded debris, such as dirt and even algae off the walls and floor of the pool, capturing much of it in the attached filter bag. The rest goes into the main filter. And like the other robotic pool cleaners, it cleans virtually any surfaced pool (vinyl-lined, gunite, concrete, pebble tech, fiberglass, etc.) and provides full pool coverage, including walls. The 360 with its two-jet construction will literally blast embedded dirt, debris and algae from the entire pool surface, much of it being captured in the sturdy attached all-purpose filter bag. The Polaris® 360 reduces electricity, chemical and pool maintenance costs. This durable underwater creature is built to last and is virtually Maintenance-Free. We recommend this model for virtually any in ground pool. The Polaris® 360 comes complete with filter bag, hose assembly, back-up valve & wall fitting. **Note the Polaris® 360 runs off your existing filter system.